The real challenge nowadays does not only lie in conceiving a great idea, but in its execution. A great idea which is executed poorly, results in ‘good’. And as Jim Collins states: “Good is the enemy of great”. Transportation and Motion: ideas are briefed from creatives or business developers through account managers and project managers to architects, designers or developers. The core of the creative idea gets lost in translation. This results in overprocessing and overproduction: the end result does not match the expectations of the idea creators. Work needs to be redone, losing time and money. This well known comic summarizes this pretty well. How to prevent this? How can an organisation best move from idea to execution? I’m not going to proclaim big theories or dogmatic rules in this field. I’m just going to share what I found a big help in these kind of situations, in particular in digital advertising projects: User Stories. Although User Stories originated in XP and are nowadays heavily used in Agile development practices such as Scrum, they are not part of the classical digital advertising project or process. It is my opinion that they really help to put the idea in the center of your project. As a TYPE OF USER, I want to GOAL, so that REASON. Card: the User Story is written down on a card. It’s tangible, it sticks to walls, it moves. Conversation: more important than the card itself, is the conversation it instigates. All stakeholders talk about the right things from the start, focusing on what is essential to the execution of the idea. Confirmation: every User Story has Acceptance Criteria. These are used to define on which basis a Story will be tested or validated. By gathering all the functional elements of your idea in User Stories, you brief with minimum documentation, talking from the start about the right things, leaving open enough space to add maximum value. For more information on User Stories, feel free to check this slideshare deck, I presented at Barcamp VRT last January. The motives behind these 3 principles perfectly match with User Stories. 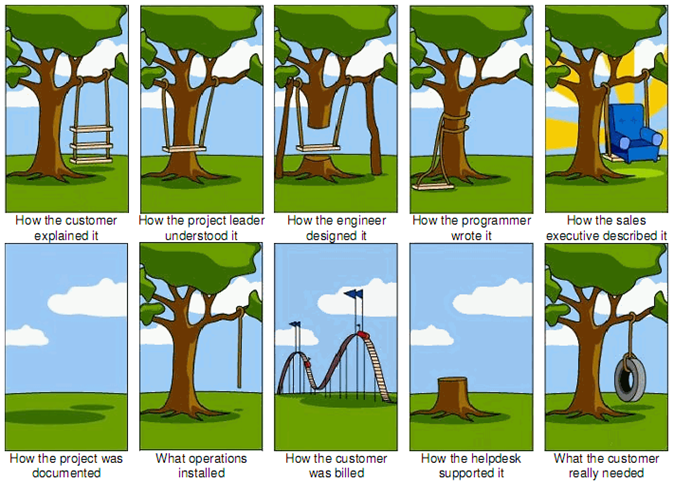 The Client Brief and User Stories are very much alike. They are the same solution to the same kind of problem. They focus on conversation, collaboration and interaction, early in the process, to deliver as much value as fast as possible to everyone involved. So, whatever industry you’re in, stop writing and start talking! PS: this blog post is an attempt to link two concepts from two completely different worlds. Feel free to comment where you think I’m not clear enough, or where I should elaborate more or less.